These adorable dogs can move their heads and tails. Use them to make your own special breed. 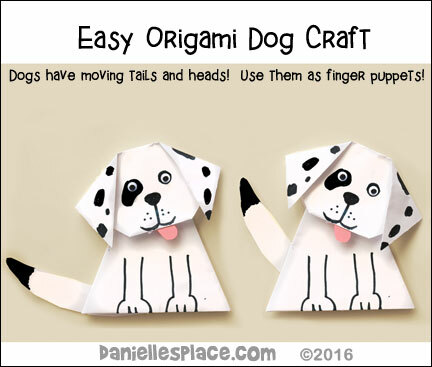 Show your children how to place their fingers inside the folded paper bodies to make their finger puppets to act out stories about dogs. 1. To make the head of the dog cut a piece of paper so it is 5 1/2" square and then fold it in half to make a triangle shape. 2. With the fold of the paper at the top fold down the two top corners to make ears. 3. To make the muzzle fold up the top, bottom corner and glue it down. 4. Cut off the back bottom corner. 5. To make the body of the dog cut a sheet of paper 8.5” by 8.5” and follow the directions on how to make a paper cup craft from the Octopus Craft. 6. Draw in the dog's eyes, nose, and add details. 7. Punch a hole in the back of the head and the top of the body. Attach the head to the body with a brass fastener. 8. Cut out a tail from paper and attach it to the back of the body with a brass fastener. 1. 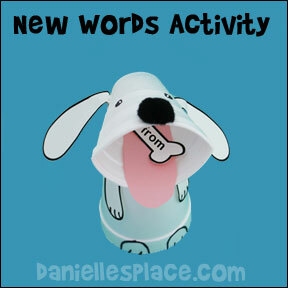 Make the paper cup dog craft and use it to review words from dog stories your child reads. Have your child write down the words he didn't know from the book "Just Dog" on stripes of 2" x 4" paper or on bone shapes and place them in the dog's mouth. Have him say the words as he puts them in. If he does not know one, have him place it in the back of the pile of words and keep playing until he knows all the words. 2. Write the words your child didn't know in the book "Just Dog" on strips of paper or dog bone shapes and hide them around the room. Have your children help the dog find the words and say the words as he finds them, and then place them in the dog's mouth. 1. Talk about how everyone likes to get attention and be noticed, but that sometimes parents are very busy and can't always give their children all the attention they want. Talk about some things parents must do that takes attention away from their children such as: talk on the phone, pay the bills, answer the door, work, etc. Discuss what your child can do when you can't give him or her attention right away such as writing note so he doesn't forget his question, tapping on your arm to let you know he needs your attention and then waiting quietly until you can help him, or offering to help you with the chores so that his or her parents have more time to give attention, etc. 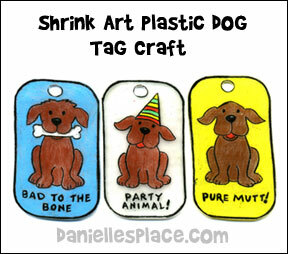 Set of four dog tags to make for your dog - "Bad to the Bone", "Party Animal", "Pure Mutt!" and "No Fleas Allowed". 1. Print out the dog tag patterns. 2. Tape the patterns onto the back of a Shrinky Dink sheet, the shiny side. 3. Color the pictures starting with your lightest colors, then outline the pictures with a black color pencil. 4. Cut the dog tags out and punch a hole in the tag. You will have to punch more than once to make the hole big enough if you have a regular-sized hole punch. 1. 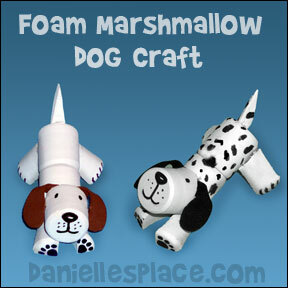 Glue two foam marshmallows together (flat sides together) for the body. 2. To make the legs cut one marshmallow in half long ways and then cut both half pieces in half again the same way. Cut a wedge-shaped piece off of the ends of the two pieces to make the back legs as shown in the picture on the left. The cut should be opposite for the left leg. Glue them to the body as shown with the rounded sides out. The dogs rear is up in the air. You can make him lying flat with his legs out to the side if you would like. 3. Glue the other two leg pieces to the front as shown in the picture. 4. To make the head cut a slit down the middle of a marshmallow on the flat side about 1 cm deep. Make another slit from the round side meeting the cut in the center as shown in the picture to the right. Glue the head onto the body as shown. 5. Cut a wedge shape for the tail from another marshmallow and glue to the back. 6. Cut ears from fun foam and glue to the head. Draw on the eyes, nose, and mouth with a permanent marker. 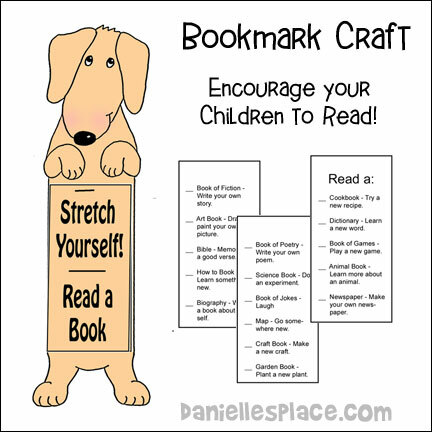 Used as a bookmark and check-off list for books your children have read, this dog bookmark craft is a great way to get your children interested in new genres. Packed with fun activities, it will encourage your children to stretch themselves this summer! Cookbook - Try a new recipe. Dictionary - Learn a new word. Book of Games - Play a new game. Animal Book - Learn more about an animal. Newspaper - Make your own news paper. Book of Poetry - Write your own poem. Science Book - Do an experiment. Map - Go somewhere new. Craft Book - Make a new craft. Garden Book - Plant a new plant. Book of Fiction - Write your own story. Art Book - Draw or paint your own picture. 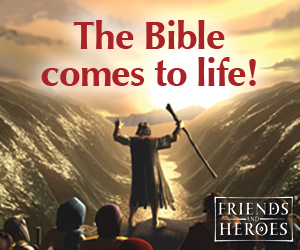 Bible - Memorize a good verse. How to Book - Learn something new. 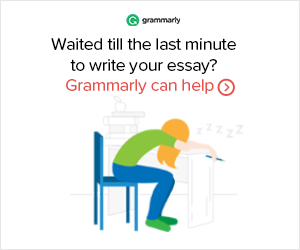 Biography - Write a book about your self. Big, Bad, Bluey the Dog never does what he is told. Poor Bluey has to learn why it is important to obey the hard way. Use this book to discuss with your children the importance of obeying. Proverbs 6:20-23, "My son, keep your father's command, And do not forsake the law of your mother. Bind them continually upon your heart; Tie them around your neck. When you roam, they will lead you; When you sleep, they will keep you; And when you awake, they will speak with you. For the commandment is a lamp, And the law a light; Reproofs of instruction are the way of life,"